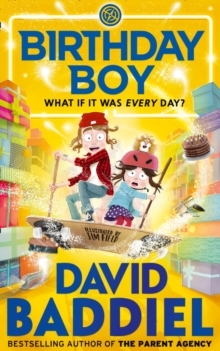 A hilarious rollercoaster ride of pure entertainment for 9+ readers everywhere, Birthday Boy is the new Baddiel Blockbuster: featuring David’s inimitable and award-winning combination of wish-fulfilment, heart and hilarity, all brought to life by regular collaborator Jim Field’s witty, stylish illustrations. What if it was every day? This is the story of Sam Green, who really, really, really loves birthdays. He loves the special breakfasts in bed. The presents. The themed parties. Blowing out the candles on his cake. Everything. He is so excited about his 11th birthday, in fact, that he wishes it was his birthday every day. So, at first, it’s quite exciting when his birthday happens again the next morning.